We welcome all children and adults to explore and deepen their faith with the many learning opportunities Christ Church offers through our Christian Formation programs. Children's classes and adult forums meet every Sunday at 9:15 a.m. While the children go to their respective classrooms, adults meet in the Good Shepherd Room until 10:15 a.m. with the Rev. Peter Faass and other lay leaders. Our Journey to Adulthood teens join the adults at the beginning of the 10:30 a.m. service. Children in grades 7 and under join the congregation at the passing of the peace so they can participate in communion with their parents. We post our current programs on the Events & News page. General information about our children's and adult programs is below. Children are a very special gift from God and are welcome at all worship services and events. For our littlest members, the nursery is a safe and stimulating place to play and learn about the love of God. All people, regardless of age, are welcome to receive Holy Eucharist. Parents using the nursery often bring their little ones down to Church to receive the bread and wine on Sunday mornings. Our church family isn’t complete without them! Julie and Camille, our wonderful paid child care providers, work year-round in our nursery. During the school year, the nursery opens at 9:00 a.m. so that parents can attend adult classes and Holy Eucharist, and it closes at about 11:45 a.m., after the 10:30 service concludes. During the summer months, the nursery is open from 10:15–11:45 a.m. so parents can attend Holy Eucharist. The nursery is located on the second floor of the building. Child care is also available for special services and events. If you would like to request child care or more information, please email Leslie Swaim-Fox, Director of Christian Formation, or call the church office. A small model altar for the child to set. A manger and clay figures of baby Jesus, Mary, Joseph and the shepherds to act out the narrative of Jesus’ birth. A tray of flour, yeast and water to mix together and observe as a meditation on the parable of the Kingdom of God and the Leaven. Handmade maps of the land of Israel with small flags to label mountains, regions, and cities, as a way of exploring the place where Jesus lived. Interactive timelines exploring the History of the Kingdom of God and the history of the Jewish people. Our catechists (teachers) have trained for over 90 hours to prepare for this wonderful ministry. 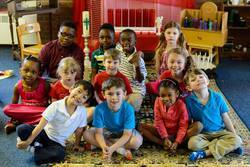 The Catechesis of the Good Shepherd is a Montessori-based program, designed to meet the developmental and spiritual needs of children in three age groups: Preschool and kindergarten; first through third grade; and fourth through seventh grade. Children meet in the atrium from 9:15 a.m. to approximately 11:10 a.m., when they join their families in the service at the "Exchange of the Peace" so that they can have communion with our church family. Time in atrium prepares children for meaningful participation in worship at Christ Church. Children help to lead our worship by serving as acolytes and junior choir members throughout the year. To learn more about the Catechesis of the Good Shepherd, visit Leslie’s blog, Thoughts from the Sheepfold, or to the National Association of the Catechesis of the Good Shepherd. If you would like more information, please email Leslie Swaim-Fox, Director of Christian Formation, or call the church office. Youth are active in learning, service, and worship at Christ Church. Guided by adult mentors, our youth participate in the Journey to Adulthood Program – a youth program based on two guiding principles; manhood and womanhood are free gifts from God, and adulthood must be earned. Youth gather throughout the year for service projects and social gatherings and participate in worship as acolytes, Junior Choir members, ushers and lay readers. Youth members also sit on the Vestry and Worship Committee of the Church. If you would like more information please email Leslie Swaim-Fox, Director of Christian Formation, or call the church office. All are welcome to explore and deepen their faith at Christ Church and there are many learning opportunities for adults in our parish. Forums vary throughout the year and include many theological topics, social issues, and book discussions. In our popular “Stump the Clergy" Sundays, you can ask Peter questions about theology, scripture, the intersections of faith and culture, and find out all those things you always wanted to know about the Episcopal Church but were afraid to ask! Lots of exciting, thought provoking, interesting programs are scheduled throughout the year, and it's never too late to present your favorite topic at the Adult Forum! We list all upcoming forums on our Events & News page. Email your topic ideas to the Rector. Adults gather twice a week for Bible study (see above). Throughout the year, there are many other opportunities for adult learning including “Episcopal 101 and Pizza” and our weekly Lenten classes. If you would like more information please email the Rev. Peter Faass, our rector, or Leslie Swaim-Fox, Director of Christian Formation.